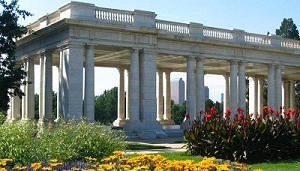 The Cheesman Park neighborhood (often misspelled as Cheeseman) is located just southeast of Downtown Denver. It is bordered by Colfax Ave to the north, York St to the east, 8th Ave to the south, and Downing St to the west. It is one of Denver’s older neighborhoods. Cheesman Park contains two historic districts with a large variety of homes ranging from early 20th century mansions (some converted to condos), Denver Squares, Victorian homes, mid- and high-rise apartments, and small commercial buildings holding coffee shops, bars, small boutiques, and restaurants. The neighborhood has a wide variety of residents from mansion owners, dog-friendly folk, renters, and is also considered one of the most gay-friendly neighborhoods in the city of Denver. Primary attractions include Cheesman Park, a beautiful 81-acre urban park located in the center of the neighborhood. The park has received extensive renovations in the past couple years from long biking and walking trails to the addition of trees, lights, and flowers. Bordering the park to the east is the Denver Botanic Gardens. This popular Denver attraction is one of the top-ranked botanical gardens in the US. The 23-acre park holds a conservatory, a wide variety of theme gardens, and a sunken amphitheater which holds concerts in the summer. Use the link below to view all of the wonderful homes that Denver has to offer. It truly provides some of the best Denver, CO real estate listings in the area.